Aziz Ansari’s anticipated Netflix series Master of None premieres on Nov. 6, and follows the life of his character Dev, a 30-year-old actor figuring out what he wants out of life. Master of None’s realistic, millennial message about finding your passion, finding the one, finding your place, and finding the best Instagram filter brings humor to situations we all find ourselves in when we are figuring it all out. 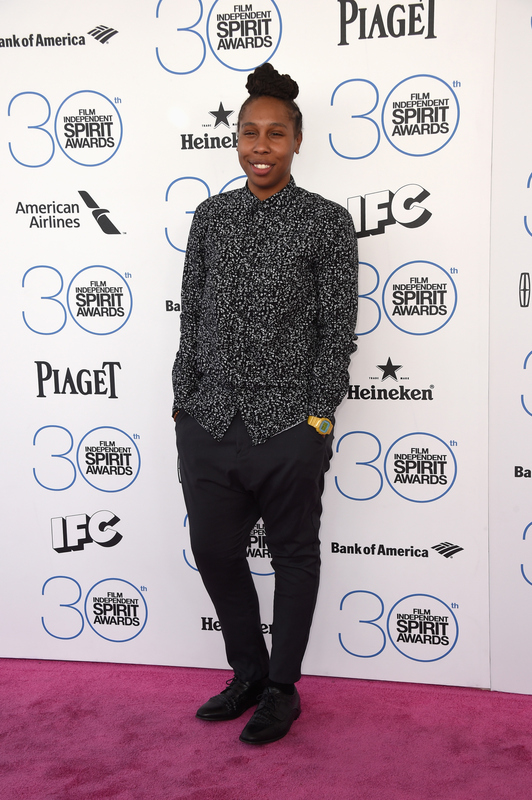 Though Dev may be the focus of the series, it looks at how those themes affect many other characters, including Denise, played on Master of None by Lena Waithe. In addition to Ansari, the show's cast boasts actors Ravi Patel, H. Jon Benjamin, Eric Wareheim, Noël Wells (whose character will serve as a love interest for Dev), Kevin Yu, and Waithe. The 31-year-old writer, producer, and actress will play Dev’s best friend, and in an interview with the Chicago Sun-Times, Waithe discussed how easy it was to play that part, and what the casting process was like. Originally, I think the character of Denise was supposed to be this white, straight girl, and here I am — an African-American lesbian woman. But Aziz and I clicked right away and developed this interesting bond. We had great chemistry right from the start. So he and [fellow executive producers] Alan Yang and Michael Schur decided to just make this character of Denise more like Lena! I am so excited to get to know Denise, and Waithe, so before you marathon the Netflix series this weekend, here are six things to know about the multi-talented woman that will get you even more psyched about Master of None. This smart satire exploring racial identity against the backdrop of an Ivy League campus is a smart, must-see. According to her IMDB page, Waithe wrote 13 episodes of Fox's Bones. Waithe is from Chicago's South Side, according to her interview with the Sun-Times. According to ComingSoon, the Showtime series, created, executive produced, and written by Waithe will be "a relevant, timely and distinctive coming-of-age story of a young African American male in which just growing up can be a matter of life and death.” Grammy and Academy Award winner Common will also executive produce the series, so between him and Waithe, this show is clearly in good hands. OK, this has nothing to do with Master of None, but I love this look. And hey, maybe we'll get to see Denise get all dressed up. I can't wait to see more of Waithe when Master of None hits Netflix and introduces Denise on Nov. 6.